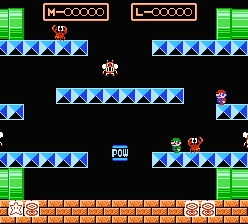 The Battle Game of Super Mario Bros. 3 can be accessed in 2-player mode by putting Mario and Luigi on the same point on the map screen. It is based on, and plays similarly too, the original Mario Bros. arcade game. There are a total of 12 variations that the game cycles through every time a battle game is initiated. In every variation, the objective is to collect at least 3 out of 5 coins, if not more, or simply outlive your opponent. The winner of the battle will take his next turn regardless of whose turn it was when the battle was initiated. While playing the Battle Game, both brothers will appear as regular Mario and regular Luigi, regardless of what power-ups they may possess in the game. Like the original arcade game, the sides of the screen wrap around. Unlike the original, you may use the B button to run faster than normal. You also have greater control over your jumps while in mid-air. In this mode, one player can bump the other from underneath and knock out any of the end-stage cards that they possess (the mushroom, flower, or star that provide extra lives when three are collected.) If one player manages to obtain 3 cards in this mode, the appropriate number of lives will be awarded instantaneously, and the cards are removed. Please note that, while very similar, these rules do not precisely apply to the Battle Game found in the Super Mario Bros. 3 menu of Super Mario All-Stars. The standard game is played three out of every four plays (a bonus game is presented on the fourth play.) 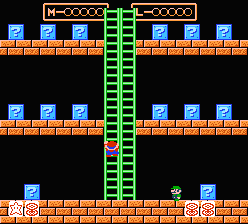 In the standard game, five enemies will appear from the pipes at the top of the screen, and work their way down to the bottom. In order to defeat an enemy, you must first hit it from underneath while it's walking on a platform. Then you must jump up and kick it off the platform while it is vulnerable. If you do not remove it from the screen in time, it will get back up, change color, and move even faster than before. If you do remove it from the screen, the player who defeated the enemy will receive one coin. These coins are the keys to victory, as the player who collects the most coins wins. The player who defeated the enemy need not necessarily be the one who flipped it over, so be careful. In the middle of the screen is a POW block. Whenever a brother punches this block, the screen shakes and any enemy standing on a platform behaves as though it had been hit from underneath. This can only be performed three times before the POW block runs out. If the brothers are taking too long to complete the battle, red fireballs will appear on some level along the left side of the screen, and bounce their way across to the right. Spinys replace the turtles from the original version, in order to remind the player that these enemies can't be stomped on to be defeated; they must be hit from below. Side Steppers continue their crabby tradition of requiring two hits in order to flip them upside-down. The first hit only makes the angry and speeds them up. Fighter Flies constantly hop their way across the screen, only setting down on the ground briefly before leaping back up in the air. Use this time to strike. 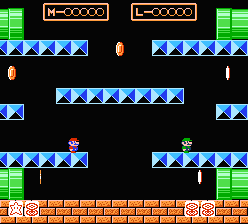 The fourth variation resembles the bonus game that is played after every few rounds in the original Mario Bros. game. In this bonus round, five coins are stationed around the stage. The round is not over until all five coins have been collected, and the player who collects three or more of them is the winner. The eight variation is an entirely new bonus scenario, in which a large pipe is situated in the middle of an otherwise empty room. Coins will burst from the pipe and scatter in every direction. You must try to catch more coins than your opponent. However, you must be careful; a fireball will occasionally escape from the pipe. If it touches one of the players, that player instantly loses. 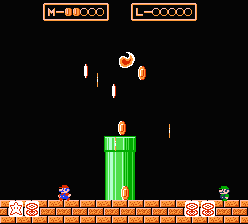 The game ends once five coins have been collected by either player, and the player with the most coins is the winner. The final bonus scenario puts the brothers in a room with several "?" blocks on the ground. Each brother must run up to each block and press to reveal their contents. Five blocks hide coins beneath them while the rest contain nothing. The game ends once all five coins have been discovered and collected, and the winner is the player with the most coins. After this variation, the game starts back over with the first variation. This page was last edited on 3 December 2014, at 05:33. This page has been accessed 28,716 times.